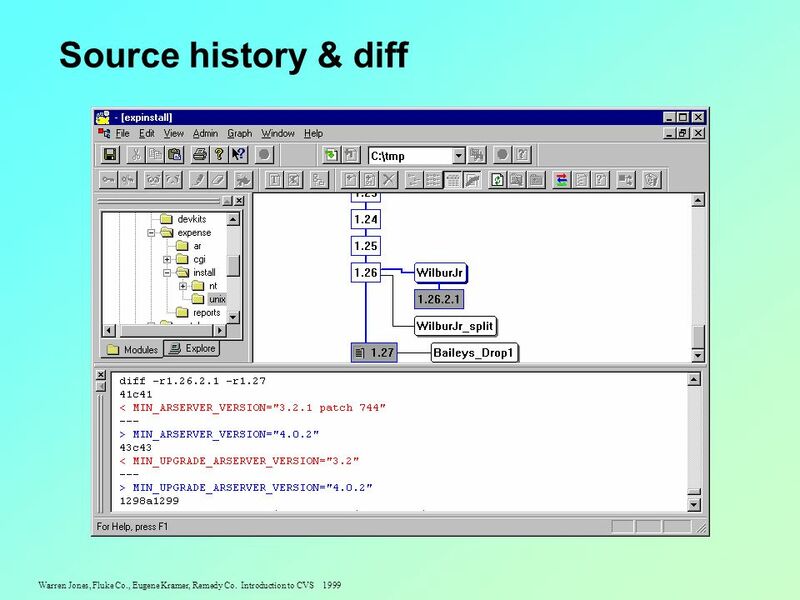 Warren Jones, Fluke Co., Eugene Kramer, Remedy Co. Introduction to CVS 1999 Concurrent Versions System Overview of CVS architecture. 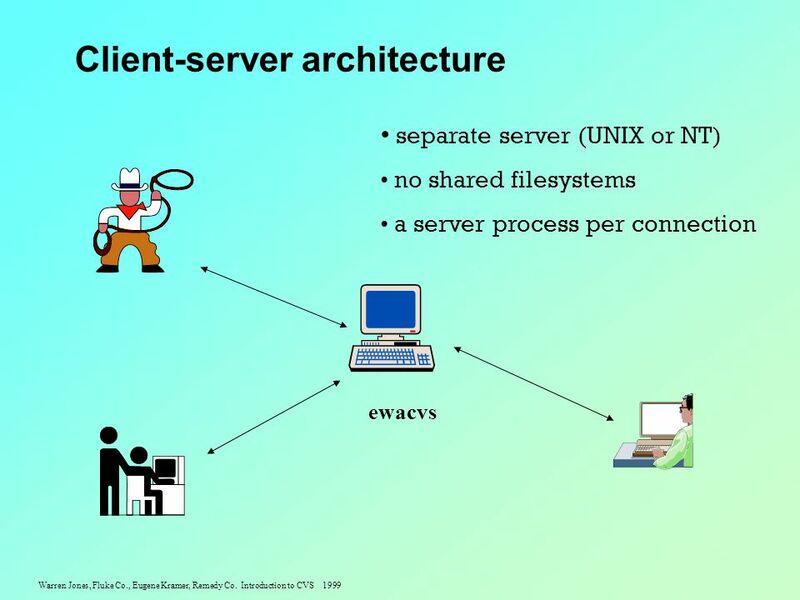 Repository structure. 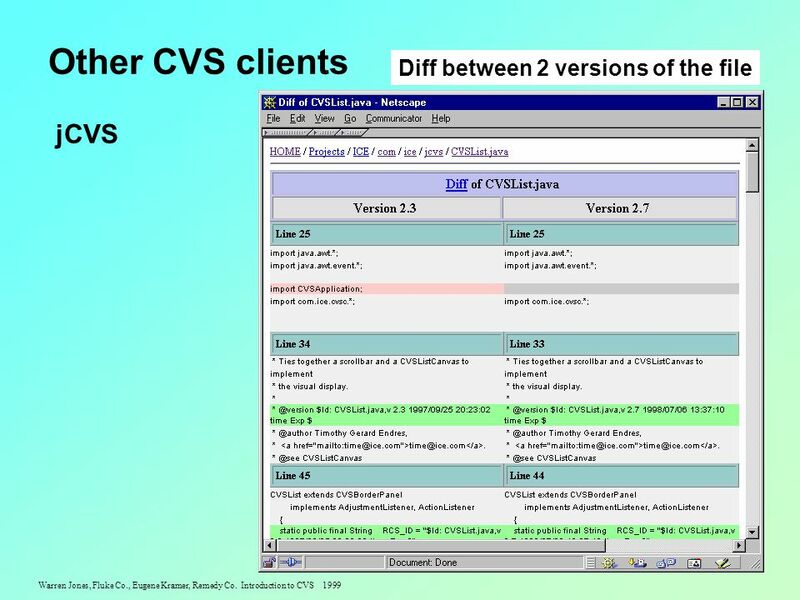 8 Warren Jones, Fluke Co., Eugene Kramer, Remedy Co. Introduction to CVS 1999 CVS and the Development Cycle 1. 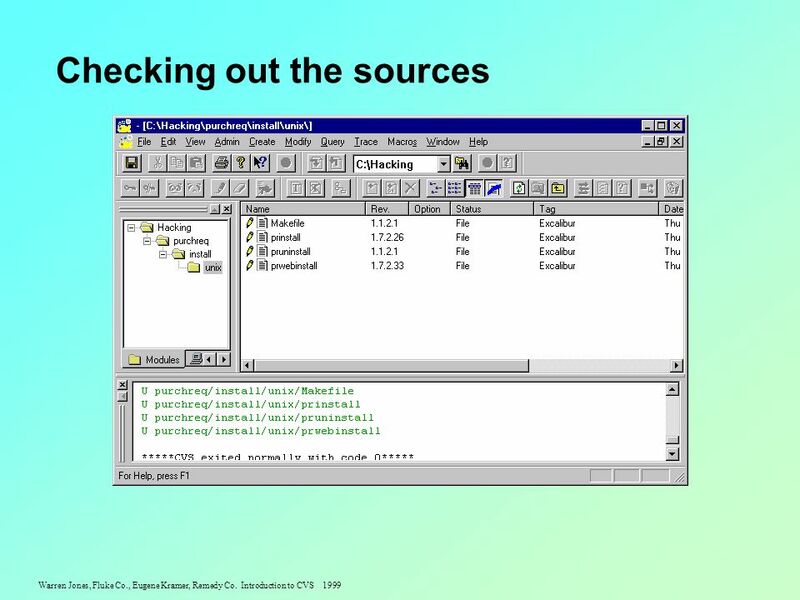 Check out source files in working directory. 2. Edit source files. 3. Unit test your code. 4. Update working files to merge in changes from other developers (if necessary). 5. Test again if the sources were merged on step 4. 6. Commit changes. 7. 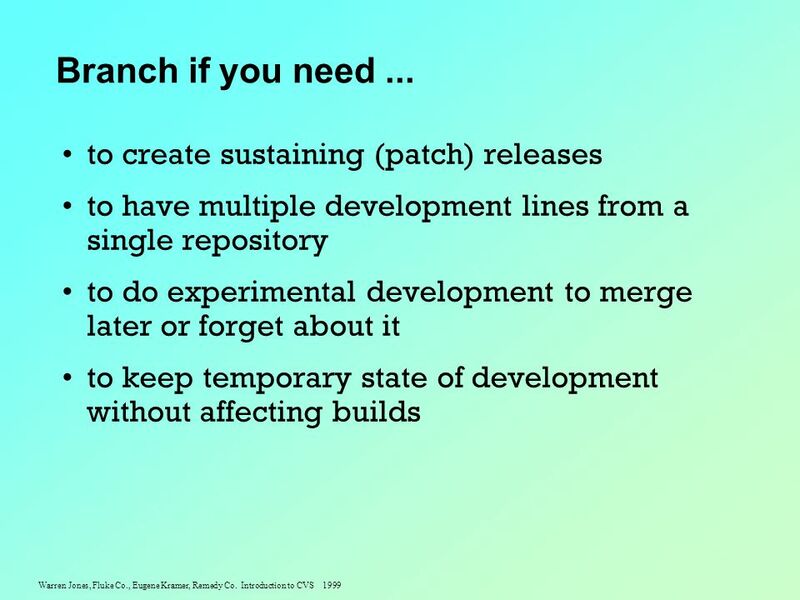 Repeat from step 2 until you have a new release. 8. Tag the release. 9. Submit the module name and release tag for integration build. 17 Warren Jones, Fluke Co., Eugene Kramer, Remedy Co. Introduction to CVS 1999 When to commit Commit to mark a working state that you might want to return to later. 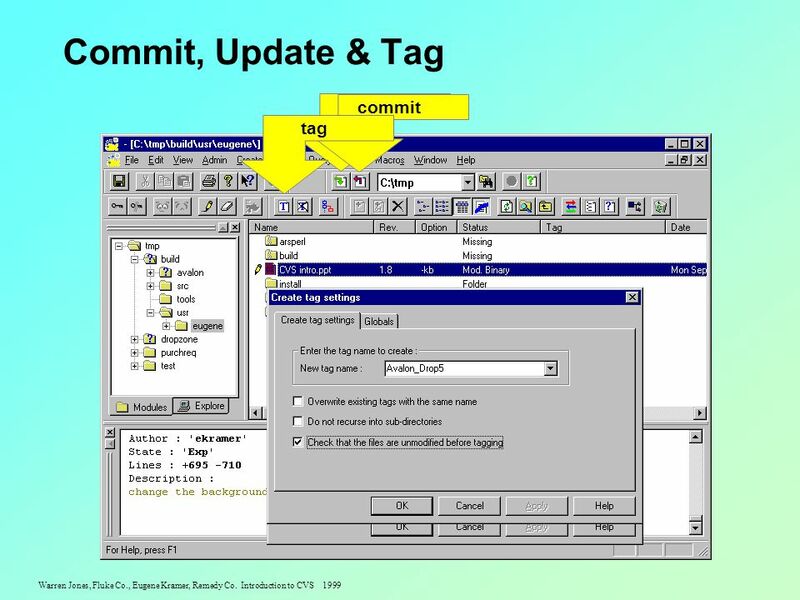 Commit related files in a single operation. Use a common log message for all the files. Commit to backup your sources. 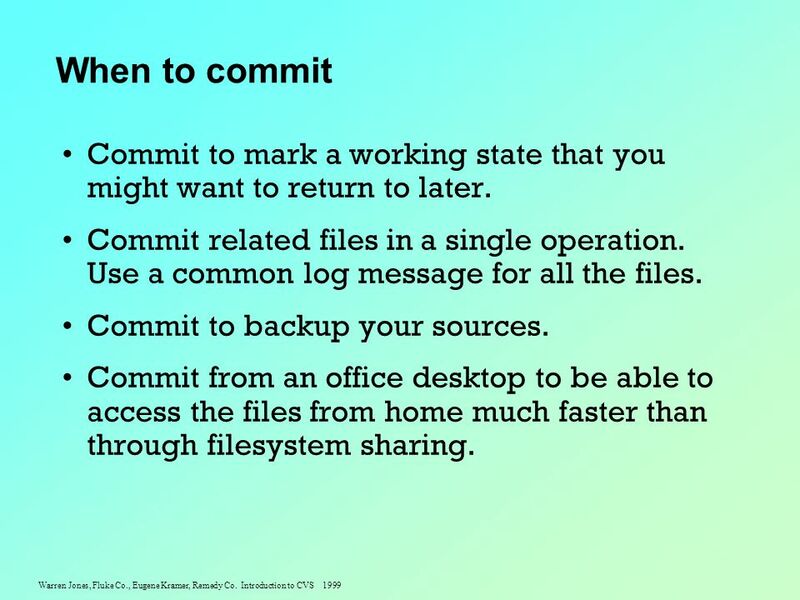 Commit from an office desktop to be able to access the files from home much faster than through filesystem sharing. 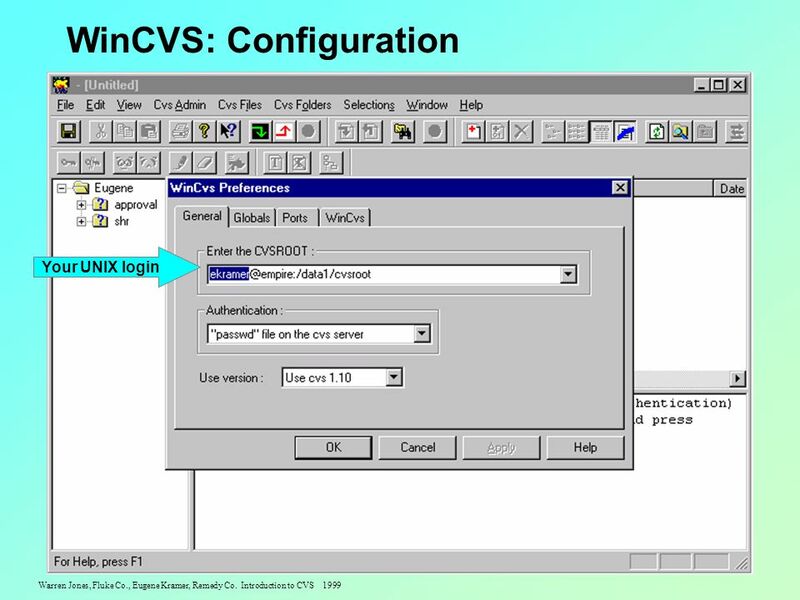 20 Warren Jones, Fluke Co., Eugene Kramer, Remedy Co. Introduction to CVS 1999 Common CVS commands cvs [cvs-options] command [cmd-options] [files] cvs checkoutCheck out source for editing. 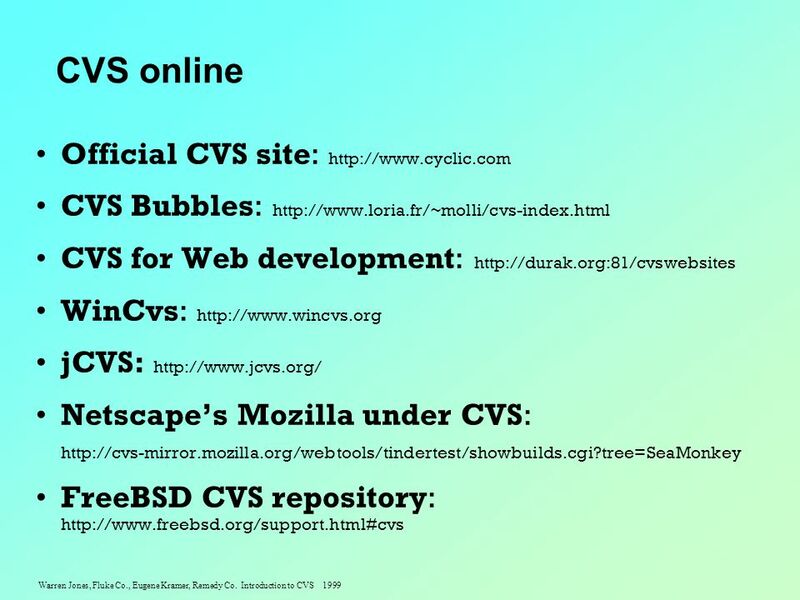 cvs addAdd new file/directory to repository. 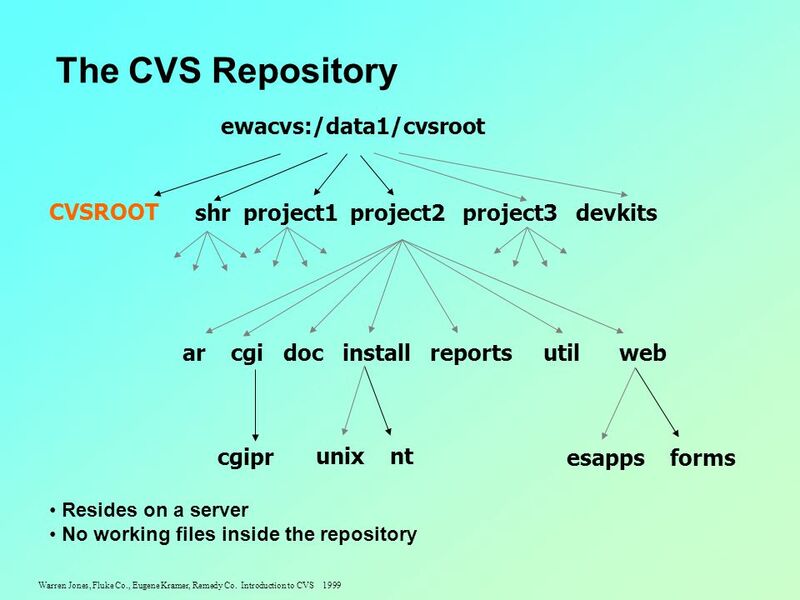 cvs removeRemove an entry from the repository. 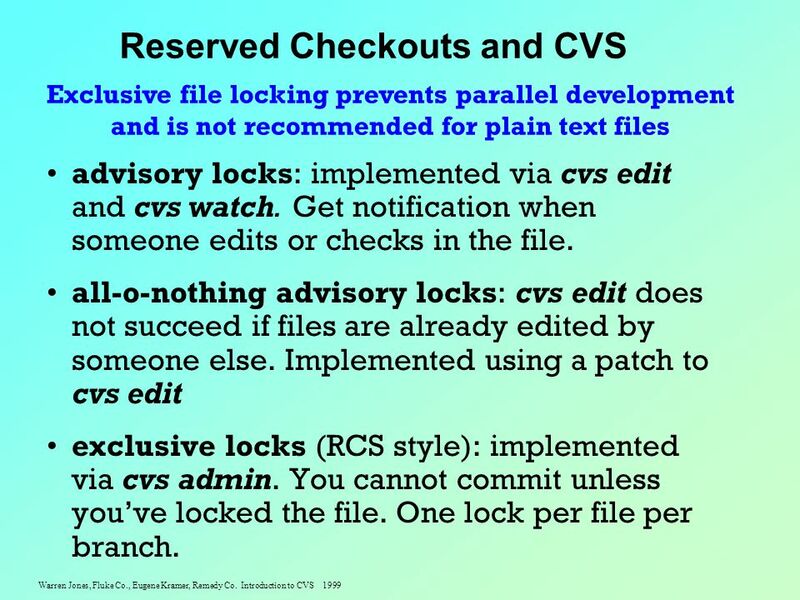 cvs statusShow status of checked out files. 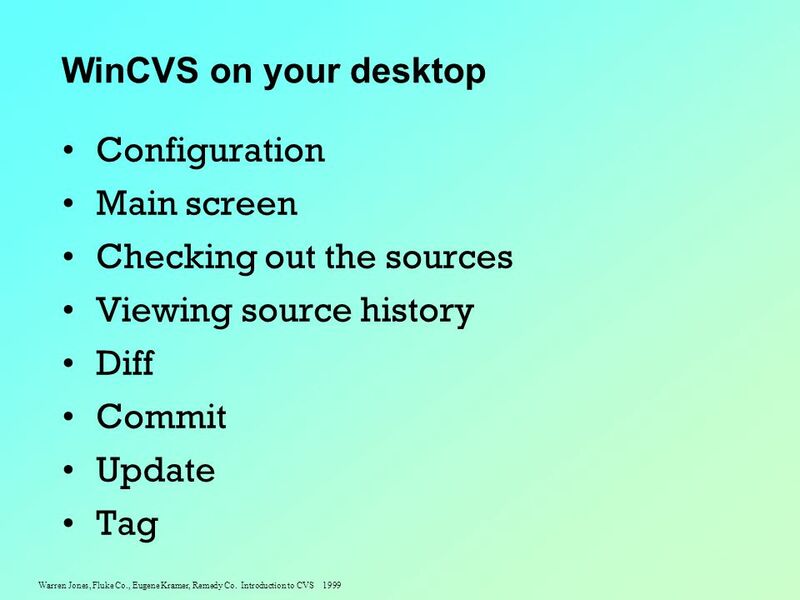 cvs logShow revision history for files. 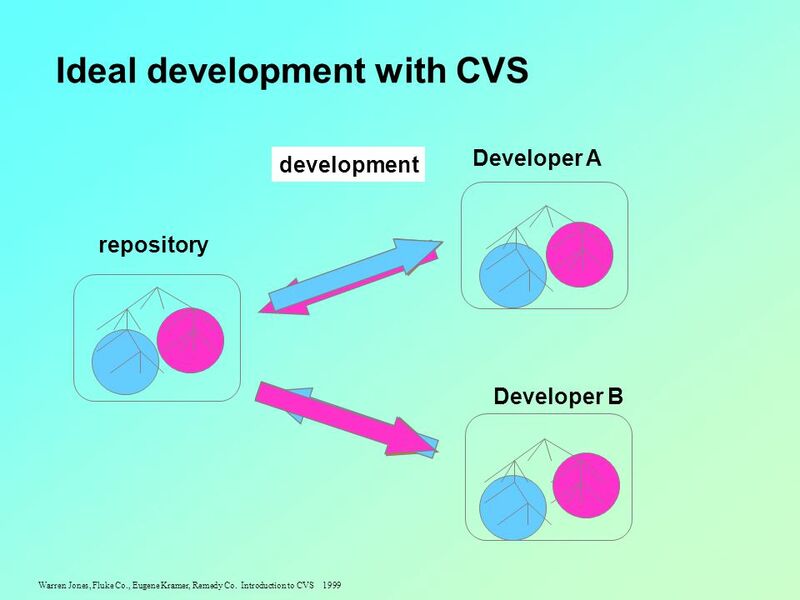 cvs diffCompare working files to version in repository or versions inside the repository. 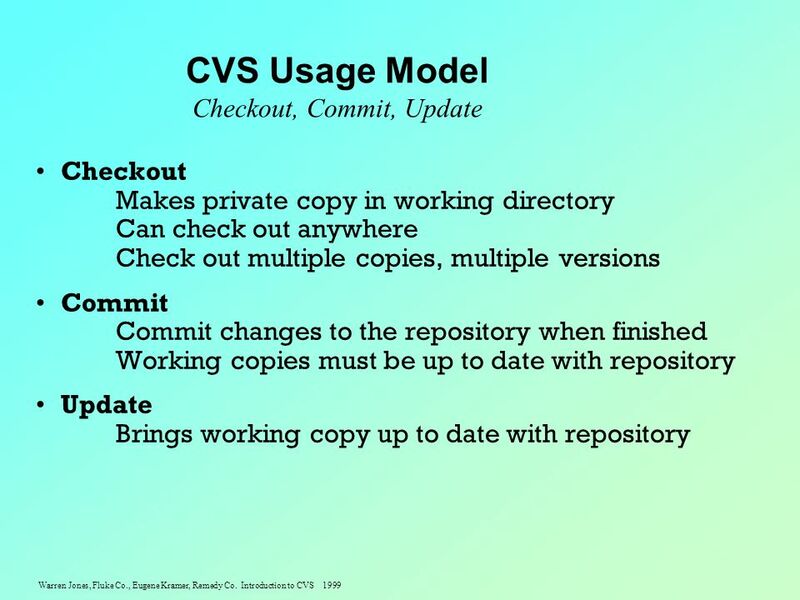 cvs updateBring working files into sync with repository. 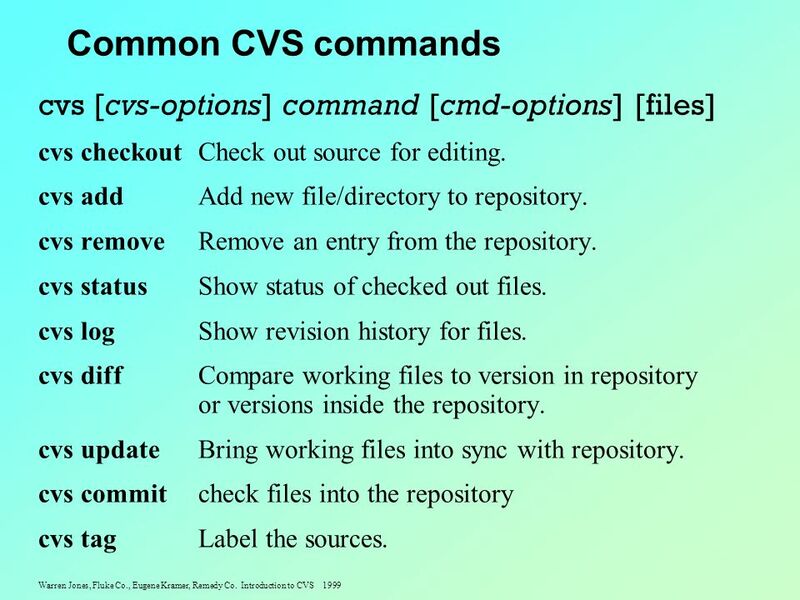 cvs commitcheck files into the repository cvs tagLabel the sources. 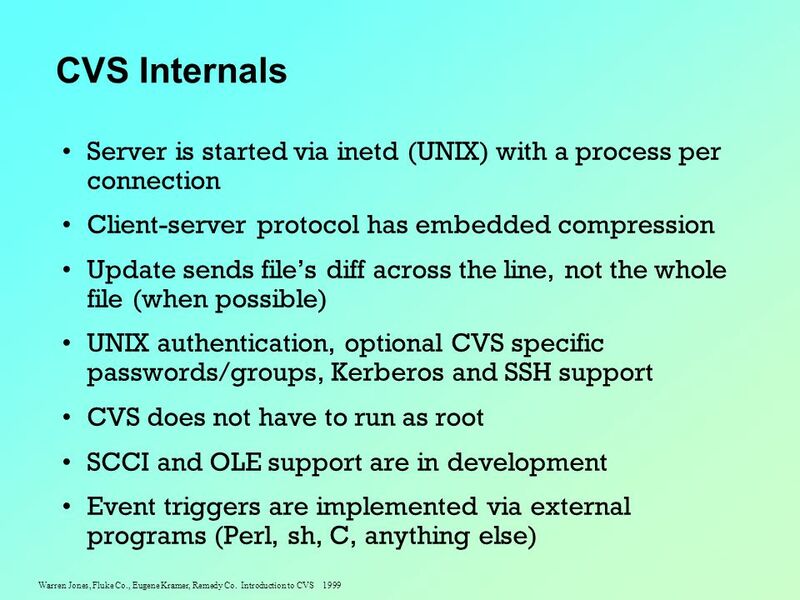 Download ppt "Warren Jones, Fluke Co., Eugene Kramer, Remedy Co. Introduction to CVS 1999 Concurrent Versions System Overview of CVS architecture. 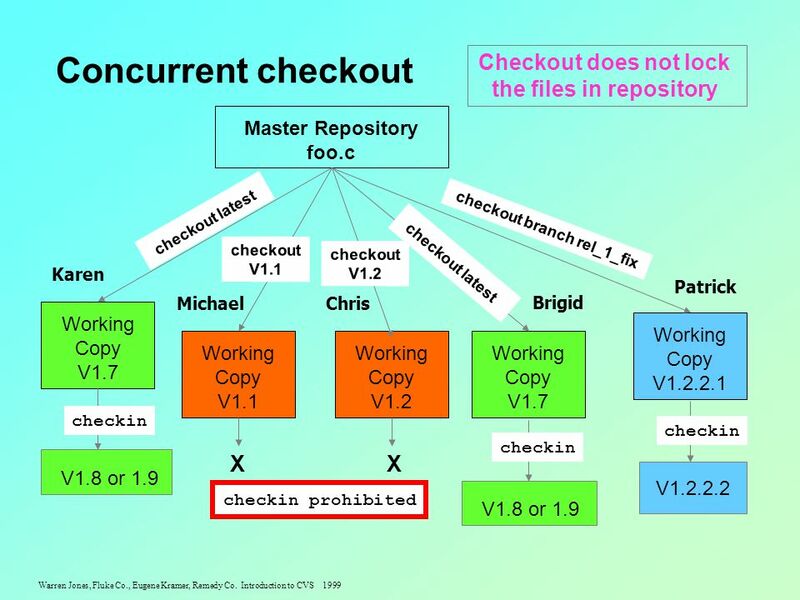 Repository structure." 2-May-15 Version Control. 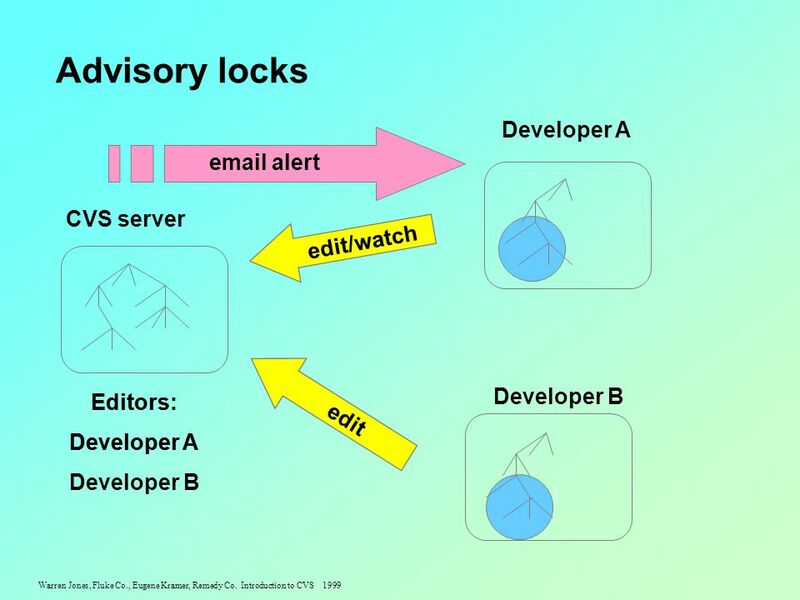 2 Why version control? Scenario 1: Your program is working You change “just one thing” Your program breaks You change it back. 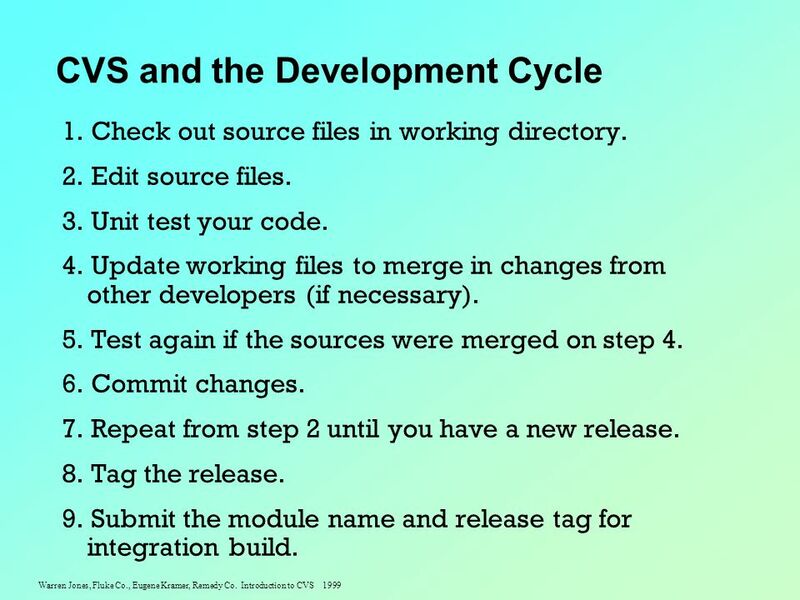 Version Control, Revision Control Software Configuration Management. 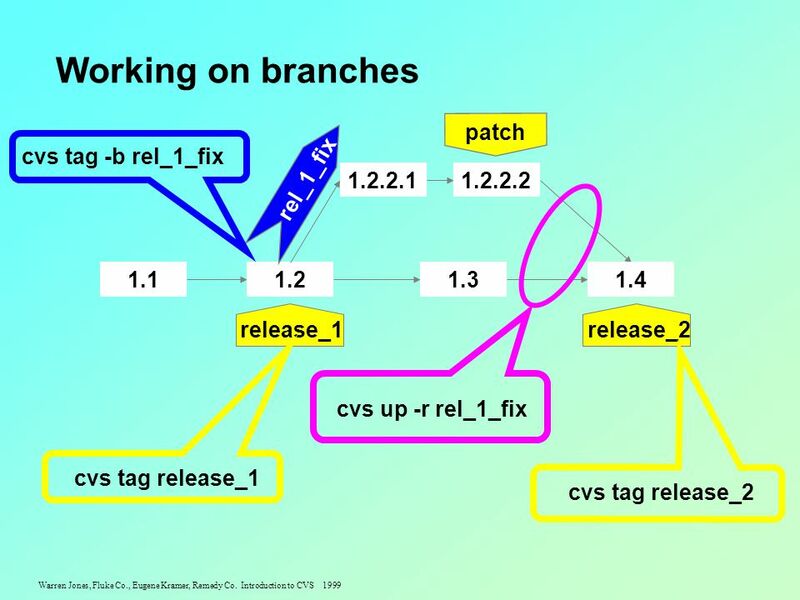 Concurrent Versioning System Chapter 8 (ALBING’s). CVS Selim Çıracı Ahmet Kara Metin Tekkalmaz. 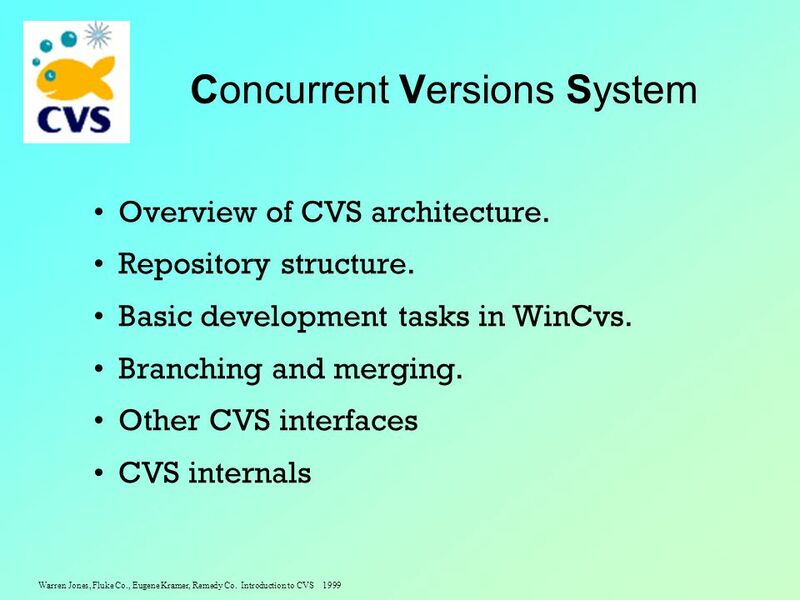 CVS – Open Source Version Control System Outline What are Version Control Systems? And why do we need them? 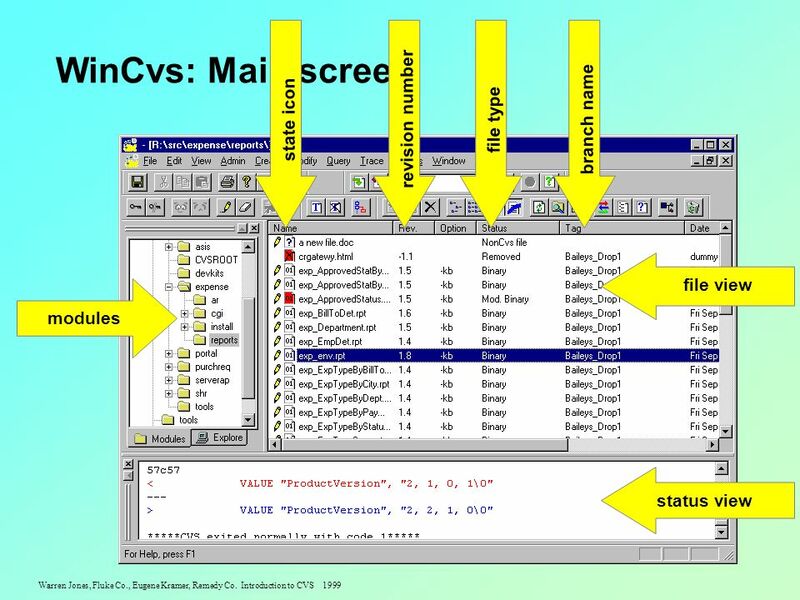 CVS II: Parallelizing Software Development Author: Brian Berliner John Tully. The iiuf Java Package Part II Simon Schubiger and Oliver Hitz DIUF, University of Fribourg. 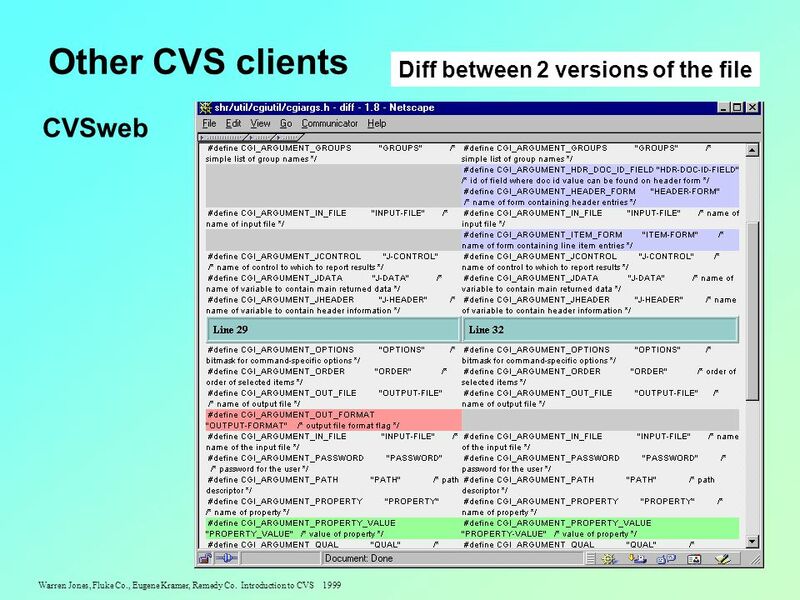 CVS Workshop I Arthur Chan. 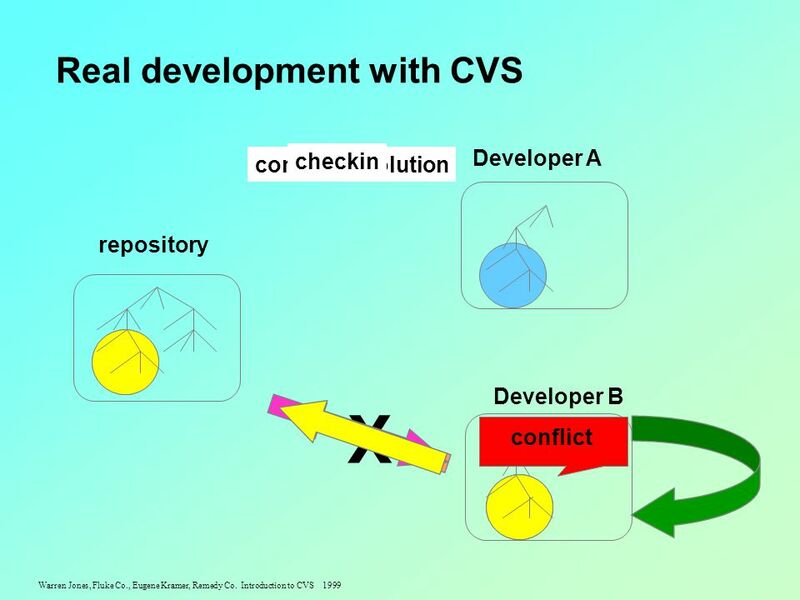 This workshop CVS overview (10%) Basic CVS commands (40%) Practical Issues in using CVS (50%) My experience in real-life For. Low level CASE: Source Code Management. Source Code Management  Also known as Configuration Management  Source Code Managers are tools that: –Archive. Object-Oriented Analysis & Design Subversion. 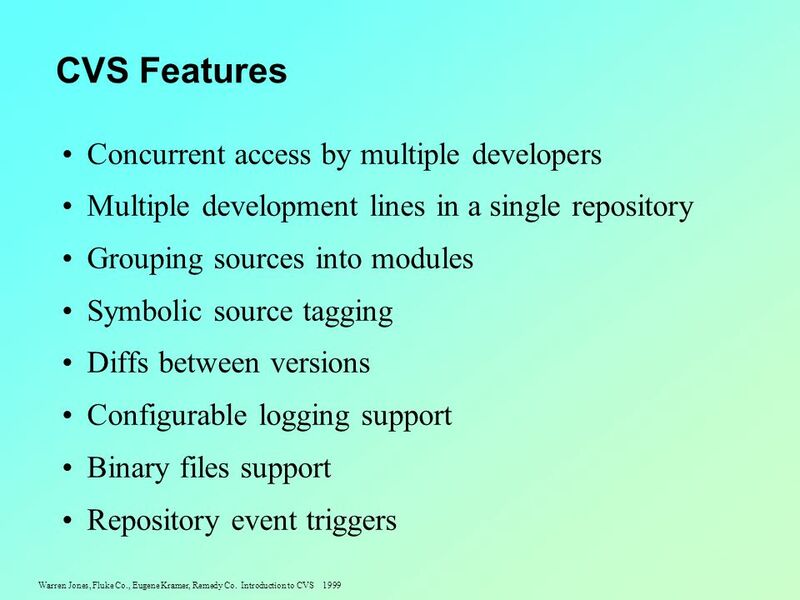 Contents  Configuration management  The repository  Versioning  Tags  Branches  Subversion 2.